Greek – or, for that matter, any language with a different ethnography – is notoriously difficult for speakers whose native or most-commonly-used language utilises the Latin alphabet (for those who aren’t familiar: that’s your ABCs, as opposed to your АБВs). Though quite au fait with other European languages, and having been bilingual since the age of 5, our travel-blogger Jo Franco definitely learned this the hard way! Shut Up and Go to Athens! This August, travel-blogger Jo Franco from Shut Up and Go sets her sights on Athens, the cradle of western civilisation and the birthplace of democracy – and home to our Greek-language school! Our partners over at the Greek school will be helping her to tell her epsilons from her omicrons and giving her a foundation in a language with a history spanning more than 34 centuries. 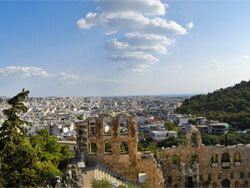 Athens is the oldest capital in Europe and one of the oldest cities in the world. It is a remarkable city, drenched in history and culture. If you want to learn Greek this is the perfect place for you to go! 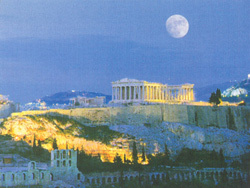 Athens doesn’t just give you an incredible opportunity to improve your Greek language skills in an authentic environment. 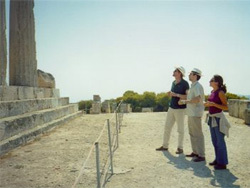 It also offers astonishing sights and amazing activities.